Shoes - Things to consider before you choose! These Manolo Blahnik's were both darling and comfortable! 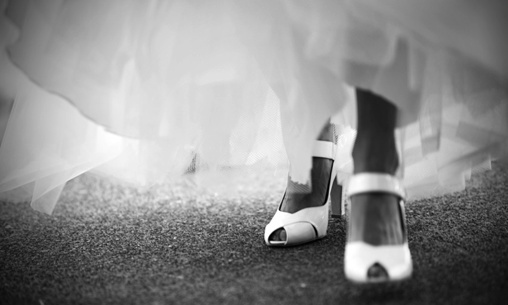 Shoes shopping is always a good time, but when shopping for your wedding shoes there are some things to consider that you may not think about! They may look TO DIE FOR on the shelf, but once they are on your feet - it's a whole different ball game! We have seen many a bride with shoes that just don't work for the 'day of' and are here to offer some advice on being polite to the peds.•Comfort is a must!You are going to be sporting these shoes for over 8 hours, it is our suggestion that you find a gorgeous pair that won't leave you hobbling at the end of the night. You don't have to sacrifice style for comfort, just take you time in finding the right pair for you.•Size matters!Be sure that your shoes are the proper size, we recommend that you shop for your shoes at the end of the day when your feet are the largest. (Did we say largest? We meant they are a little less small than they were in the morning.) Better?•Heel or not to heel?If you are not schooled in wearing heels, please don't pick your wedding day to try them for the first time! It's not fun to have aching feet and burning calves!•Dressed for your shoes!This is of the utmost importance! Try your shoes on with your dress and walk around in your dress, not to the mirror and back, but really walk around! This will give you time to take note if the dress is the right length with the shoes, if you are comfortable, or if your dress or petticoat gets caught on the shoes. Keep these points in mind when you are on the shoe hunt! Happy Shopping!